How much damage can a Trump presidency undo? Boy, have whites done hard time under Barack Hussein Obama! To deliver his inauguration benediction, eight accursed years back, Obama commissioned one Rev. Joseph Lowery. Indeed, on day one, Obama and his bitter and twisted better half hammered home that to be white in their America was never to be right. To be black was to have an eternal claim against whites, for no other reason than that they’re white. Although America is the land of quotas, set-asides and affirmative action—a country that privileges minorities—the majority is, nevertheless, subjected to non-stop, relentless propaganda. Enforced by the tyranny of political correctness, this agitprop has led white Americans, most of whom harbor no racial animus, to believe racism saturates their society. So, whites say nothing when they’re roped into a Sisyphean struggle to appease the unappeasable. With the election of Donald Trump, white America has essentially told these race pimps to talk to the hand (‘cause the face ain’t listening). They’ve had enough of the pigment burden. Besides, as a pragmatist and a doer, Trump is constitutionally indifferent to the racial-grievance industry. Ahead of President-elect Trump’s inauguration, Sharpton’s “We Shall Not be Moved March” will take place on January 14. The reverend and his foot soldiers at CNN will meander to the Martin Luther King Jr. Memorial. There, they will say stuff as memorable and meaningful as the ectoplasm that tumbled from Obama’s mouth, during his farewell address. Let us hope that President-elect Trump “shall not be moved,” and that Al’s presence in the People’s House will be greatly reduced under a Trump administration. For as of June 2016, the White House Visitor Records logged 57 Obama-Sharpton love-ins. The mythistory Sharpton peddles on this tape, frequently played by the heroic Sean Hannity, is called Afrocentrism. It’s promoted by a number of undistinguished African academics and imparted in some schools across North America, from grade school through to the university level, and, naturally, in the African Studies department. I don’t know how else to break it to you, but the white man stole the black man’s accomplishments. According to the Sharpton abracadabra, Africans have an ineffable claim against Europeans. For how does one put a price on the mugging of a civilization? The gist of Afrocentric mythistory: The venerable Greeks, the founders of Western Civilization, stole their philosophical and scientific know-how from Egypt. Egypt, and not Greece, is the fount of Western tradition. And although artifacts indicate that the Egyptians were more Benetton than black; by Sharpton’s telling, the Egyptians were actually black Africans. How did this civilizational mugging occur? Aristotle is said to have sojourned to Egypt with Alexander the Great, smuggled books out of the Alexandrian library, and slapped his name on these books, promoting them as his own. He wasn’t alone. Socrates, Pythagoras and Plato were plagiarizers in their own right. Elizabeth Taylor The Appropriator had no business playing Cleopatra. The Macedonian of the Ptolemaic bloodline was really a long-limbed black woman. In Afrocentric mythistory, even the Sphinx had negroid features. That is until it became the target of one of the first documented, racially motivated acts of vandalism. 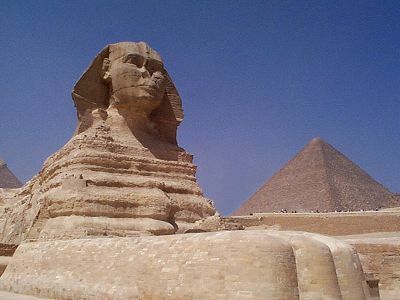 The facial crater borne so stoically by the Sphinx comes—don’t you know?—from being socked on the nose by Napoleon’s racist troops. Is there no end to the antics of those white bad boys? Tune in to Part II. Especially crucial for parents whose kids are pedagogically institutionalized, it’ll counter Afrocentric mythistory.